The genius of this very simple musical is that it shows how Jesus's birth turned everyone's expectations upside down! The long-awaited Messiah was expected to be a royal king, born in a palace - very far from the truth of his humble origins! 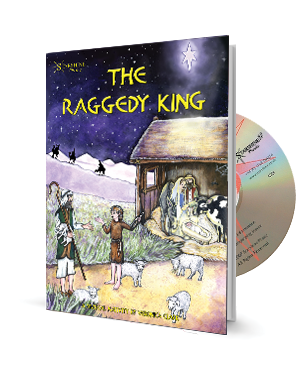 A lovely nativity play for young children, with songs that are very appealing and easy to teach. In the hills, David the shepherd boy practices playing his pipe - in anticipation of the coming of the great Messiah, who he imagines arriving complete with crown and flowing robes amid plenty of ceremony. Angels arrive, with news that the Messiah has been born in Bethlehem - in a stable! David is not impressed! He is NOT going to play his pipe for a poor little 'Raggedy King' in a humble stable. But all the same, David goes to Bethlehem with the others. Will he be willing to play his pipe when he gets there? A delightful production that was enjoyed by children, parents and staff alike with a part for all ages and abilities within our infant school. The play was a huge success. The congregation really enjoyed it. The message was simple, the songs great. 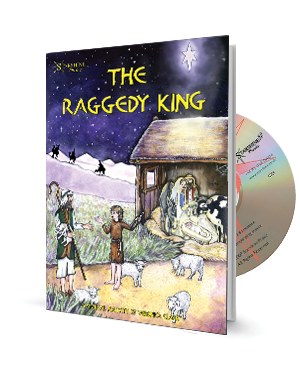 The Raggedy King is a wonderful musical for this age group. The songs are lovely, and the wide range of instruments used in the backings enhance the children's performances beautifully. The Raggedy King was a delight to do. The children took to the music ever so easily. The piano score was very easy to follow and the CD was super. An interesting working of an old story. An excellent libretto which is easy to use for specialists or non-specialists. Both The Raggedy King and Miracle Child were absolutely fantastic!! We have had only positive feedback and everyone commented on the beautiful musical numbers in both pieces. The children who took part in the productions have had the most wonderful time rehearsing and performing these two magical musicals. I really can't thank you enough for making my job so pleasurable and stress-free, and working with 54 children that has to be a wonder! !